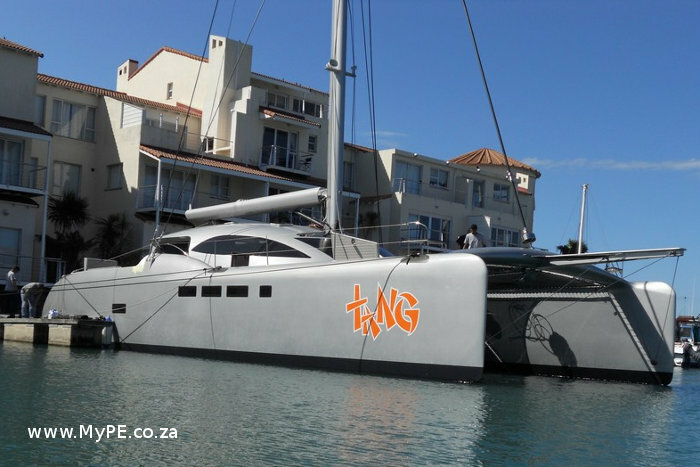 The first TAG 60 foot high performance catamaran, TANG – a culmination of the foresight of yard owner and avid Catamaran Sailor, Tim Van Der Steene – was launched in 2010. This luxury catamaran has been well received both locally and overseas. The second all carbon boat was launched in 2011. South African Transport Minister Dipuo Peters has received approval from Cabinet on the recommendation to provide an urgent lease agreement to Tag Yachts Ltd.
“Its objective is to initiate manufacturing of high end composite catamarans in the Port Elizabeth Harbour,” a statement by Cabinet said on Thursday. This is for the assigned responsibility for the marine manufacturing Delivery Unit under Operation Phakisa initiatives to establish a composite Boat-Building Cluster in the Eastern Cape. Operation Phakisa is an innovative approach that enables government and key stakeholders to transform high level plans into detailed implementation programmes to fast-track delivery of results. The programme is an adaptation of the Big Fast Results methodology that was first applied by the Malaysian Government in the delivery of its Economic Transformation Programme and the Government Transformation Programme. The yachts are equipped with state of the art technology allowing them to be sailed short handed without compromising performance or comfort. The benefit is to sail to destinations quickly so that relaxation and leisure time is maximized for family and friends.